February 11, 2018: Two weeks have just about come and gone, and it’s incredible the difference those days will make. Playing abroad and being in a new country is truly not for everyone. It is a constant push out of your comfort zone, and there are definitely times that it feels easier to retreat into your safe space. Alas, you keep pushing, and eventually, it does get easier. Last weekend, we had our first training match. Now, keep in mind I traveled 3,700 miles (6,000 km) to get from Boston to Sweden, and then our first match is in Finland – what are the odds?! So we woke up early to get to our field, to catch a bus, to get to a ferry, to sail for two hours, to get back on the bus and find the indoor facility on the Åland Islands. It was quite the endeavor. We played against Åland United, which is a club in the first league in Finland. I was surprised to hear their entire team speaking in mostly English – I suspect there were several international players with them. You've got to love pro football abroad! Our team was missing a few starters, and we came away with a 2-2 tie. I think we probably were the better team, having roughly 70% of possession, but you know how silly football can be sometimes! I really like playing with our team. There seems to be good chemistry, and for so many new faces, that can be hard to come by. The back line in particular is great. I love being able to fully trust and rely on all three of the other defenders. As a centerback (or mittback here in Sweden), it’s all about trust. When you give a command and know those around you are going to listen, you know you’ve got a good group. A week of training was spent correcting errors from the training match, and working on the way we'd defend for our next game. But somewhere, amidst the training, and gym, and walking in the cold... I had a visitor! That's right... it's Kelsey from LFC IA!! You probably recognize her from running to shows at RDCs, clinics, camps, or taking care of our general office wellbeing. 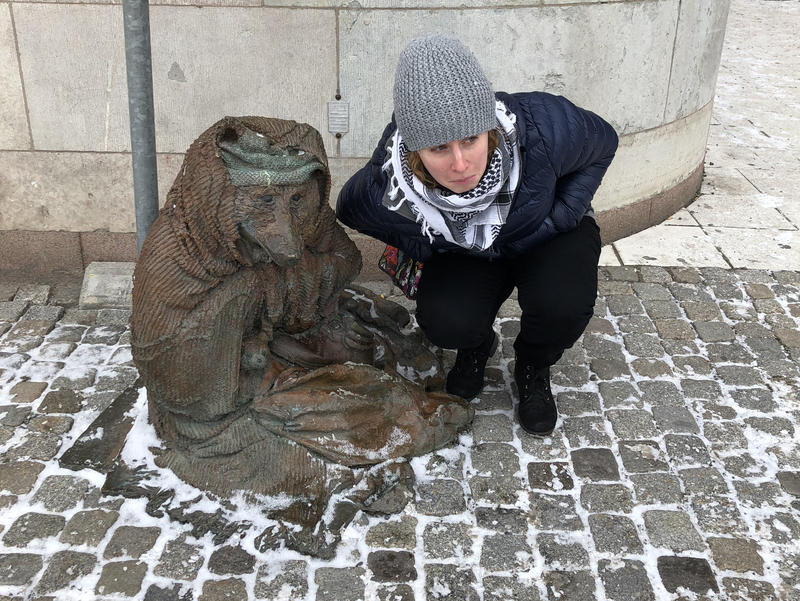 She came here before our team trip to Liverpool, and we spent a day wandering Stockholm so I could show her all about Swedish fika and viking culture. We had a blast wandering the streets, discussing things such as our favorite cities to eat cheap food, our lovely coworkers (all good things of course 😊) and perhaps most importantly... all about the Swedish candy selection - necessary. Yesterday was out first real match of the year, and I had as many fans as anyone (yay Kelsey!). 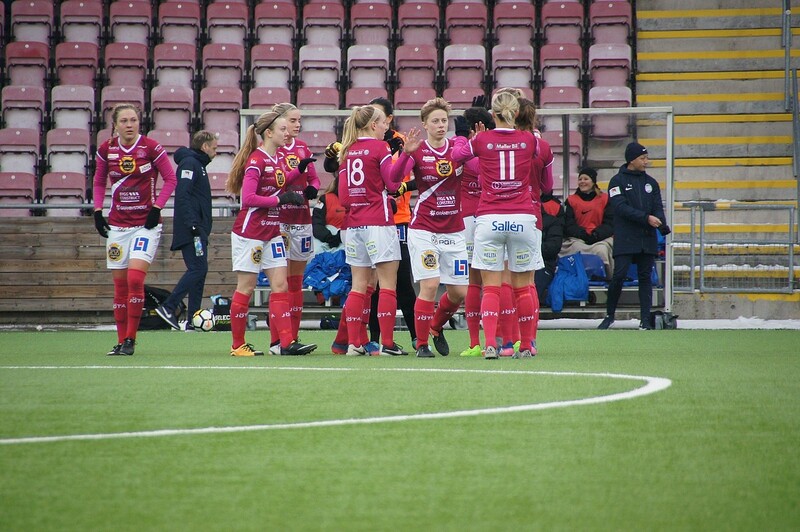 It was round one of the Svenska Cupen, or Swedish Cup, and we were up against Eskilstuna United. Eskilstuna is a league above us, in the Damallsvenskan. They finished top three last year, and have a couple of Swedish National Team players… of course forwards. Needless to say, we knew it would be a good test for us. Again, we were missing two starters, but we came out really strong, and scored in the first two minutes of the game. Eskilstuna had a few opportunities in the first half, but our back line and keeper were working hard to seal them off. We also had possession probably between 60-70% of the time, or at least it felt that way, but we just didn’t get any more good opportunities to capitalize on. The start of the second half was nothing short of freezing. I thought my hands were going to break off! Luckily, you can’t stay cold for long once you start sprinting. Eskilstuna came out really fast; you could tell they didn’t want to be shown up by a team in a lower division. We held them off and held them off, but they were relentless. Eventually, at about 60 minutes, they scored a goal to tie it up, and had so much momentum that it felt like we were on our heels the entire rest of the game. As fate would have it, it wasn’t long before they scored again. Try as we might, we just couldn’t recover after that. We gutted it out the entire 93 minutes, but their class showed through at the end. I have to say. I don't just love winning... I despise losing. It just makes me ill. All I do is replay moments in the game and think about anything I could have done differently to prevent goals from happening. Inevitably, I can almost always track a goal back to something I should have done differently. It’s just in my nature to be self-critical. But, when you get to this level, you absolutely have to let stuff go. Mistakes happen, even to the best, but the difference in a good player and a great player is the ability to forget about the last thing you did, and focus on the next. There is no glory in self-pity, and feeling sorry isn’t going to change any outcome. The only thing it’s going to do is keep you from moving on, so, a little tip… forget about it! We will get better every game, and I’m confident that this is truly only the beginning of a great year for this team. We have all the pieces, and now it’s time to connect them. Stay tuned for more next week! Until then, it’s time for tea and a football filled Sunday afternoon on the couch. Previous Post: Welcome to Sweden!